Learn Korean in the fastest, easiest and most fun way! If you’ve ever wanted to sing Korean songs, write a letter in Korean, read Korean books, be able to get around in Korea, or just jump-start your Korean learning, you’re in the right place. Even if you’re an absolute beginner to Korean, by the time you’re done reading this article you’ll be able to read and write Hangul like a pro — and you’ll get a feel for Korean culture and learn some Korean vocabulary at the same time! What is Hangul? What does hangul mean? Korean uses 한글 (Hangeul) or Hangul alphabet as its writing system. Some people think hangul means the Korean language but it’s the name of the Korean alphabet letters. 한 (han) means ‘Korean’ and 글 (geul) means ‘letter’. And ‘Korean language’ (specifically, South Korean language) in Korean is 한국어 (hangugeo). The biggest strength of 한글 (Hangeul) is that it is very easy to learn how to read Korean and write Korean texts. There are many loan words in the Korean language that come from English, such as “taxi,” “bus,” “camera,” and so forth, so you will find yourself understanding the words in the signs or menus just by knowing how to read hangul, the Korean alphabet. Download Your FREE Korean Hangul eBook! If you want to master the Korean language and become fluent, you must learn to read hangul first. This eBook is a MUST-HAVE for all Korean learning beginners! 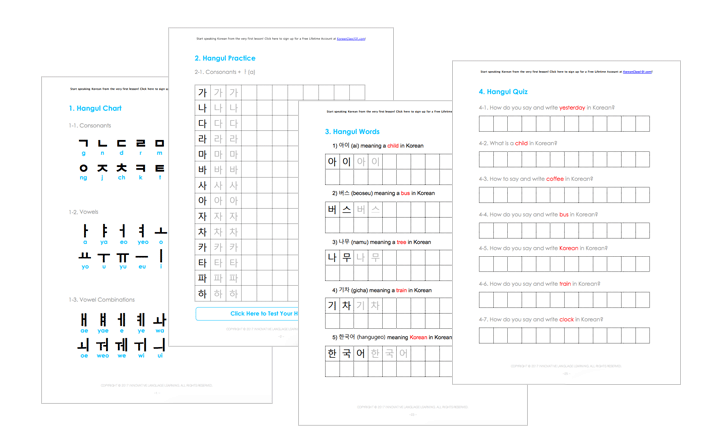 Download your FREE hangul practice sheets PDF today and master the Korean alphabet in no time! Why is Learning Hangul Important? The Korean alphabet has been called “brilliant” by linguists who study how the alphabet relates to the spoken language. Indeed, the alphabet, which is called hangul, is purposely simple in design. King 세종 (Sejong) invented 한글 (Hangeul) and announced it to the public in 1446, and it has been the official writing system ever since. King 세종 (Sejong) invented this system, which was one of the many great things that he did for the country and the people, because he felt that it was not right for Korea not to have its own writing system. Before the invention of Hangul, people used the borrowed characters from Chinese that had the closest sounds to the Korean sounds, but this was not an ideal system for writing Korean. Hanja, the Chinese script, was so complex that only the very wealthy elite were able to understand and write it. Most people in Korea were illiterate. When the Korean alphabet was introduced it quickly became popular and was used by everyone. Now, people consider Korean hangul writing to be one of the most scientific writing systems in the world because it can express more sounds more accurately than any other writing system can. The name hangul can be directly translated to mean “great script” or “Korean script.” Hangul is used in North and South Korea, but in North Korea it is called chosongul. 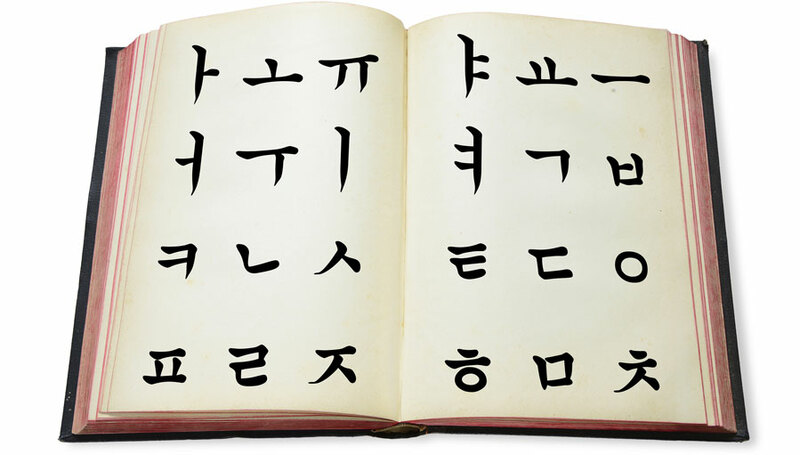 There are 24 letters in the Korean alphabet: 14 consonants and 10 vowels. 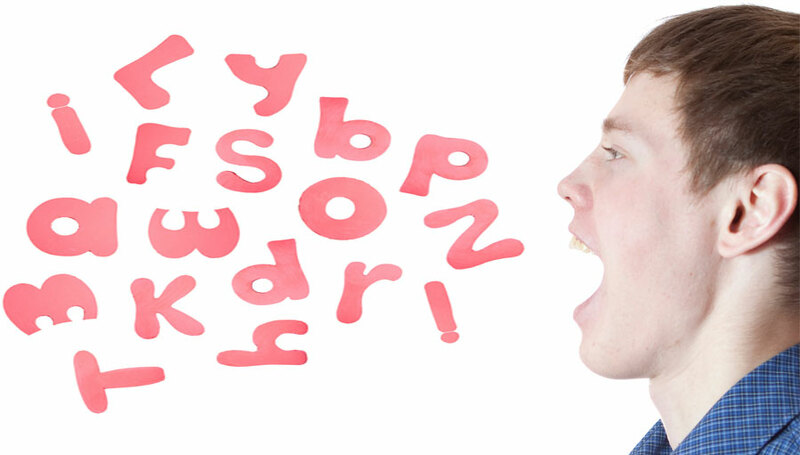 There are compound consonants and vowels too, but we form them by combining the basic consonants and vowels. Therefore, if you understand the basic consonants and vowels, of which there are just twenty-four, you can basically read everything in Korean. You form hangul words by combining consonants and vowels. Unlike in English, in which you just write one letter after another in a straight line to form words, in Korean you form a square or a block for each syllable. For example, if you want to write the English name “Sam,” it’s three letters written one after another in a line, but in Korean, it’s 샘, one letter, composed of three parts, written in a square. If you want to learn how to write your name in Korean, check out our Korean name page. These blocks are then placed left to right to form Korean words. The writing is then read left to right, similar to western writing. When students first begin learning the alphabet it is helpful to remember that all consonants are designed to represent the shape the mouth will make as you pronounce it, and all vowels are designed using horizontal or vertical strokes. Learning the alphabet will become the basis of all further Korean lessons the student chooses to undertake, so it’s important to have a clear understanding before you move on to other lessons. Though the alphabet may seem difficult to learn at first, students should keep in mind that it was designed to be learned by all Koreans and there is nothing elitist about it. If a student does find themselves feeling intimidated or becoming frustrated with the learning process, a Korean podcast can help them overcome any feelings of stress. KoreanClass101 offers podcasts that can help students further their studies of the Korean language and get them to a point where they are comfortable conversing in the language with anyone. Learning Korean letters can actually be one of the simplest portions of your lessons. Because of its inherent design the alphabet might not be so easy even a baby can learn it, but it does come close. Once you take the time to learn the alphabet, the rest of the Korean language should follow easily. The first hangul alphabet chart is the Korean character list of the basic consonants in Korean, with their similar sounds in English. The first 3 rows are basic consonants and the last row is double consonants. ㄱ (g): It sounds between g and k in English. ㄴ (n): It sounds between n and d in English. ㄷ (d): It sounds between d and t in English. ㅂ (b): It sounds between b and p in English. ㅈ (j): It sounds between n and d in English. Please note that ㅇ has no sound if it comes as the initial consonant. For instance, 아 is ㅇ (slient) + ㅏ (a) so it sounds ‘a’. However, when it comes as the final consonant, it sounds like ‘ng’ so 강 is ㄱ (g) + ㅏ (a) + ㅇ (ng) so it sounds ‘gang’ and it means ‘river’ in Korea. This Korean characters chart is the list of the hangul vowels in Korean, with the romanized hangul reading written below. The first 2 rows are basic vowels and the rest are vowel combination - You can make more vowel sounds just by combining basic vowels. Check the Korean hangul charts above. You’ll find some patterns with the Korean syllable blocks in the list of Korean letters. They are just combinations of Korean consonants and vowels. Forming a Korean letter using the consonants and the vowels from above is very easy. As mentioned above, you form hangul letters by putting them into a square shape and that’s a Korean syllable. 1) If the vowel has a long vertical line, like ㅏ, ㅑ, ㅓ, ㅕ, or ㅣ, the consonant comes in on the left half, and the vowel comes in on the right half. 2) If the vowel has a long horizontal line, like ㅗ, ㅛ, ㅜ, ㅠ, or ㅡ, the consonant comes in on the upper half, and the vowel comes in on the lower half. You can make even more combinations by combining a consonant and a combined vowel as follows. Don’t worry - you don’t need to memorize them all! You only need to understand how they’re combined. You’ll naturally read and write once you understand them. 3) After a combination of a consonant and a vowel, if there is one more consonant attached at the end, the consonant comes in at the very bottom of the already existing square, and the other parts get squeezed a little toward the top to make the entire shape a square again. And the final consonant is called 받침 (batchim). I’m not going to add all the Korean letters that you can create by combining consonants and vowels because you can read them all as long as you know you know how to sound Korean consonants and vowels. The number of mathematically possible distinct Korean blocks is 11,172, which is too much for any learners to remember. Just understand how hangul blocks work! 5. Why is Learning Hangul Important? Usually when a beginner starts learning Korean, they will learn it in romanization, with the hangul pronunciation written with the Roman alphabet. If you get addicted to romanization, you will never be able to learn Korean. Write the words correctly and in Korean! The question “Why learn hangul?” would be the same as asking you why you wanted to start studying Korean in the first place. You can’t truly understand Korean culture if you don’t understand the language in which the people write in the country. Learning the Korean writing system will give you a greater understanding of the history and culture. Learning hangul characters will give you the Korean basics you need to speak, write and read most Korean. If you want to master the language of Korea and become fluent, you must learn hangul first. Get your easy hangul writing practice sheets, showing all the characters at once. If you’re a KoreanClass101 member, you can download it for free. Click the button below! Memorize basic consonants and basic vowels. You can make combinations by combining the basic ones. Practice the combinations and see how they sound. Combine a hangul consonant and a vowel to make a letter, and read it out loud. Write them out Again and again. To learn how to properly write hangul characters you have to practice. Why are we giving it away? Learning to read and write is a must for all beginners. Although you get video lessons on how to write in Korean at KoreanClass101, you’ll still need physical hangul worksheets to practice on. 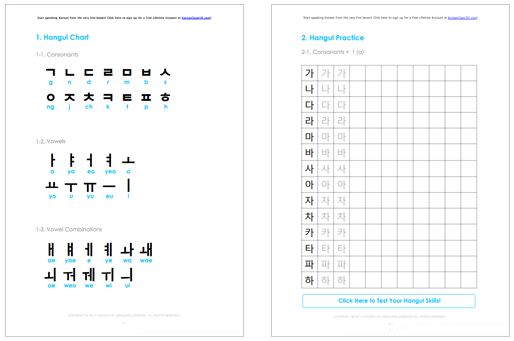 That’s why you’re getting this printable Hangul Tutorial PDFs as a gift. Now, what if I told you you could learn the Korean symbols even faster? 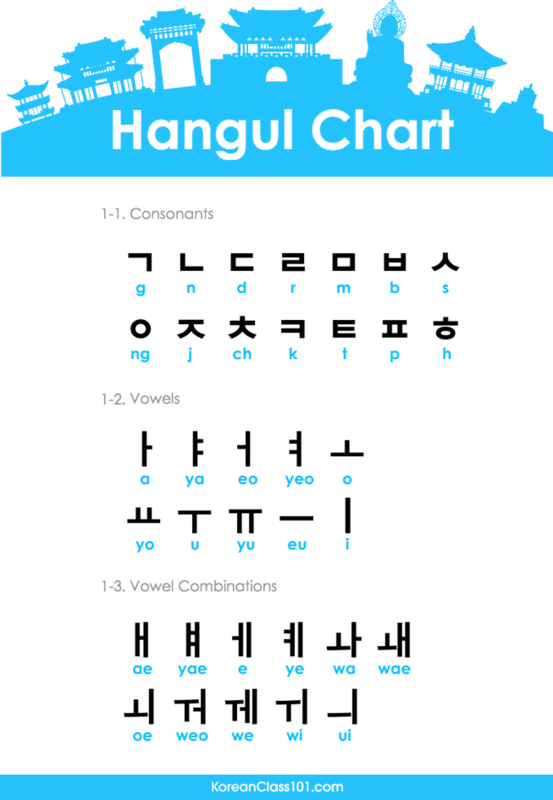 To help you master hangul we created a series to introduce them and teach you a few words you can write with these characters. 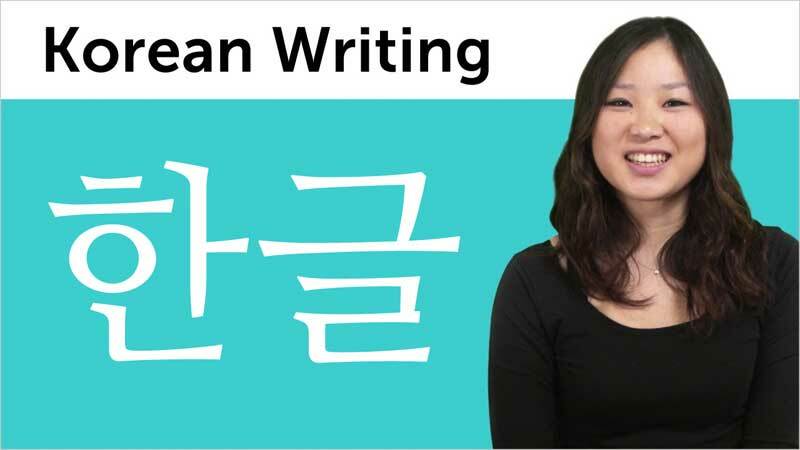 Our video series gives you all the tips you need to remember the Korean script. Have you heard of Mnemonics? Each character has a memorable illustration that goes along with it, and it is an amazing method to remember characters. We use this method to make things easier for you to memorize. We also offer you interactive practice sections with Amy, our Korean host, to learn how to perfectly write hangul without getting bored. You’ll never ever have to worry again about how to read or write hangul. Not only will you know the basics of Korean pronunciation but you’ll be able to identify a lot of common Korean words used in everyday life. It’s the best way to get started learning Korean. Watch the first episode now and discover the secret to easily learning hangul in few hours! You’ll able to practice your Korean wherever you want with our Flashcard feature and Hangul Quiz that will allow you to master the alphabet through repetition. Select your Korean level and enter your email address on the form on the left. Download your hangul book on this hangul page. Start learning Korean with KoreanClass101 & your free eBook! Test yourself with our quizzes - hangul reading test & writing test. This hangul test is the perfect way to help you practice hangul you still have difficulties with, as you select which one you need to work on. Thank you for reading. 감사합니다 –It’s thank you in Korean. Good luck with your Korean learning and let us know if you have any question. In this video series, you will learn the Korean alphabet, known as Hangul. We will teach you Hangul using simple steps, showing you the correct stroke order, helpful tricks for memorization, and proper usage in common Korean words and phrases quickly and easily. If you want to get started learning hangul, reading and writing Korean, this is THE place to start. Want to learn Korean? Don’t know where to start? This is it. The Introduction to Korean Video series is perfect for those who know zero Korean but want to take that first step. In this series, you’ll learn all about the Korean language, as well as grammar, writing and phrases to get you started. Ready to sound like a native Korean speaker? 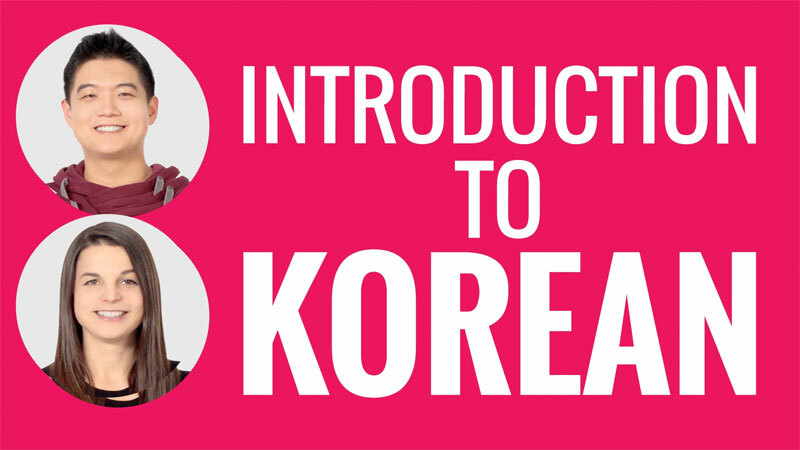 Join Alisha and Ara in the Ultimate Korean Pronunciation Series! 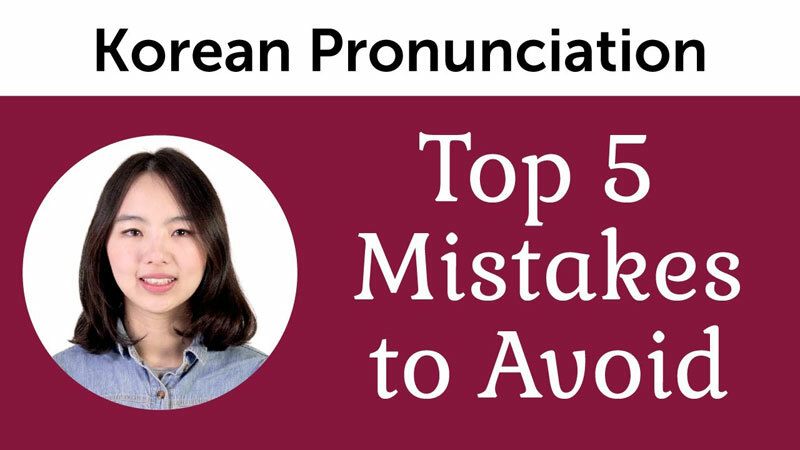 You’ll learn the ins and outs of perfect Korean pronunciation. You’ll learn the common mistakes learners make, how to avoid them, and the nuances that only native speakers are aware of. Learn the basics you need to be polite while speaking Korean. Amy will take you step-by-step through must-know phrases and explain the grammar and composition. Plus, you’ll get some special tips on how to be extra authentic when interacting with native Korean speakers.